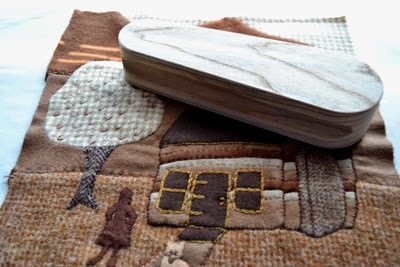 New to me and my sewing is the wooden clapper pressing board. Someone on Sewitsforsale@yahoo.com. was searching for one, and I hadn't a clue what they were talking about. This website, where sewers either sell or purchase materials, notions, patterns, sewing books or machines has become an education for me. I am constantly bumping into items that I would not have know about otherwise and curious as I am, I have to look them up. I have learned a lot! A wooden clapper pressing board is a board that is used right after steam-pressing a seam. It simply is used like an iron but sets the seam professionally without any shine to fabric. 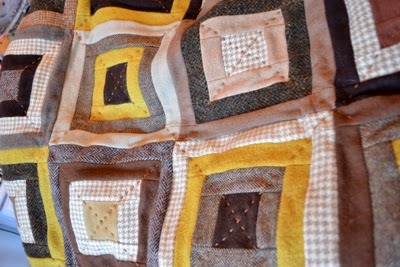 Sadly I found it after I have sewn and quilted most of this wool log cabin lap robe. 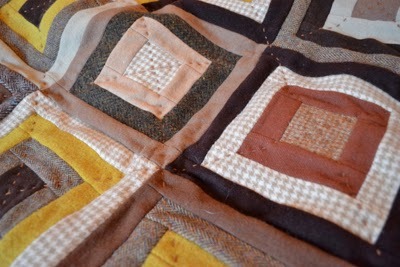 I loved the rich look of the wool in this lap robe, but the thickness of the wools made for a very "primitive-looking" quilt, as I could not get the seams to press flat. About two thirds of the way through this project my cat, Zelda, tested her teeth on the back of this lap robe. "Need is the mother of invention", I have learned too well, and so this wool quilt block will be sewn on the back to cover the tiny spots that will be mended. 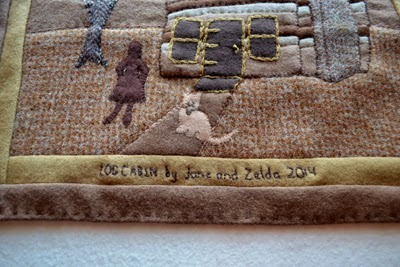 It properly credits Zelda and me for this log cabin wool lap throw. Zelda is my dearly beloved companion, but is not so friendly to quilts. 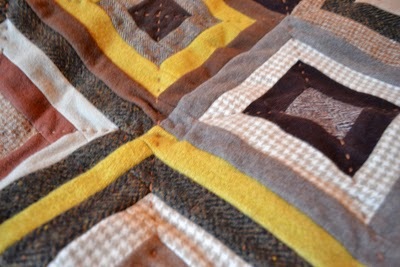 I am the owner of my mother's beautiful quilts that are stored until my Zelda's ever shortening life is over. Mind you, I always said I would never own a destructive cat. I don't "own her". She clearly "owns me and my heart" and I am learning to never say "never". 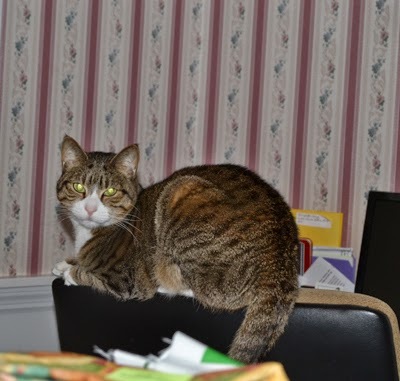 Now as I work on quilts I cover them with tin foil if I leave them on my sewing table as she avoids the foil! I also cover the top of my sofa with a "dog proof" spread and am testing it to see if it is cat proof as well. So far it seems to be more than the top of my sofa. 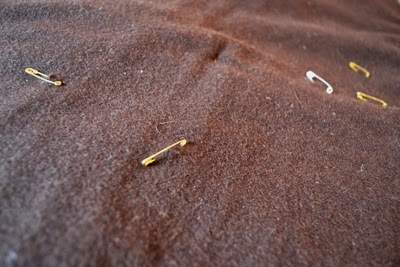 I cover my chairs with "velour" textured throws, as she has a tendency to knead them instead of bite them.. I do think that love grows in proportion to the extra care that is taken to adjust my life to those that I love. It is a good thing perhaps that my kids were both colicy, assuring that I love them with all my heart too!